Charming 1900's farm house on a lovely country road steps away from Westwind Orchard and Arrowoods Brewery. The farmhouse features a simple and practical layout of a living room with a wood burning stove, dining room, powder room and a kitchen with new appliances on the first floor and three bedrooms and a full bath on the second floor. Attic for additional storage. The large red barn on the property has been renovated as a recreation space with multiple rooms and includes a new wood burning stove, electric throughout and great lighting and ceiling fans. Four additional out-buildings on the property could be used as great children spaces/playhouses, woodworking spaces or storage. Enjoy the sounds year round of the stream at the end of the property as well as the fire pit in the back yard for summer nights. 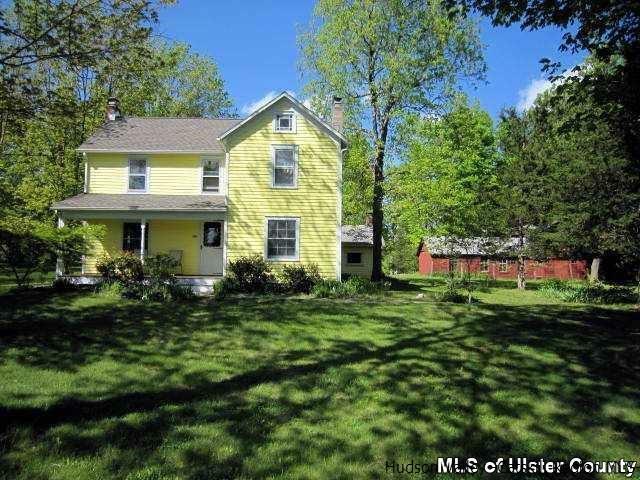 Sit on your front porch and enjoy your three acre meadow across the street. Landscape comes to life every spring. Japanese maple in front, grapes vines, blueberries, apple trees, and walnuts on property. Please remove shoes or wear the provided booties at the front door. Thank you.